10 entries have been selected by the Norwegian broadcaster NRK for this year's Melodi Grand Prix (MGP) in Norway, out of more than 1,000 songs submitted. The entries were shortlisted to 60 songs that were presented by several listening groups, who gave their opinions about the songs. 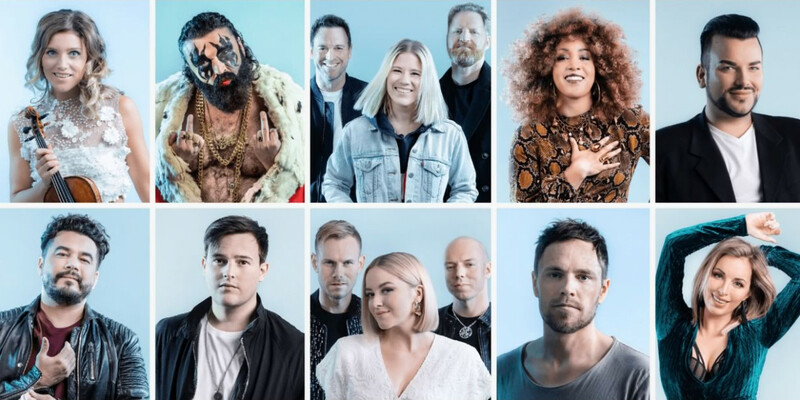 NRK chose the final 10 songs and artists.The 10 will compete in the 57th edition of Melodi Grand Prix in Oslo Spektrum on 2 March 2019. Adrian Jørgensen – "The Bubble"
Carina Dahl – "Hold Me Down"
Chris Medina – "We Try"
Erlend Bratland – "Sing for You"
Hank von Hell – "Fake It"
Ingrid Berg Mehus – "Feel"
KEiiNO – "Spirit in the Sky"
Kjetil Mørland – "En livredd mann"
Hosts of MGP 2019 are Heidi Ruud Ellingsen and Kåre Magnus Bergh. Norwegian viewers can cast their votes via televoting, while an international jury will weigh in on the outcome as well. Norway 2018: Alexander Rybak - "That's How You Write a Song"